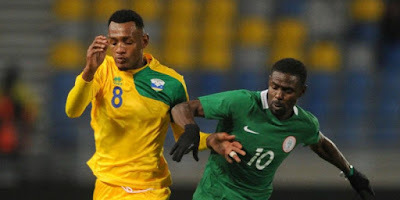 The home based Super Eagles of Nigeria have qualified for the quarter-finals of the 2018 Africa Nations Championship (CHAN) after coming from a goal down to beat already eliminated Equatorial Guinea 3-1 in Group C on Tuesday. Goals from Anthony Okpotu, Dayo Ojo and a penalty from Rabiu Ali saw Nigeria finish as Group C winners on seven points. Nigeria will now meet the runners-up in Group D in the quarter-finals on Sunday, 28 January. In the group other game also on Tuesday night, Libya pipped Rwanda 1-0 to finish second on six points.